Plumage: Cryptically colored, brown bird. 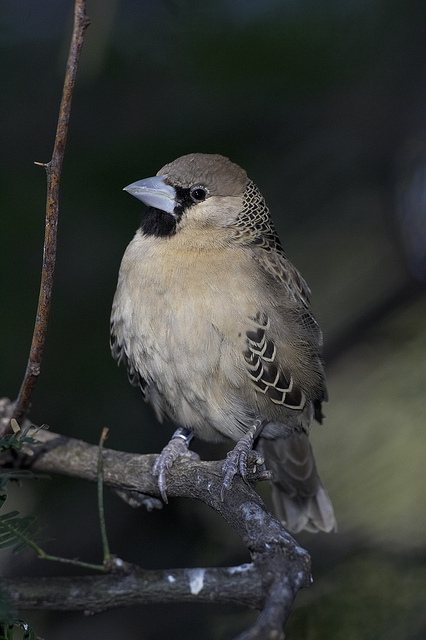 Breast and belly creamy; a black throat patch extends from the base of the bill down onto the chin and throat. A small patch of white-edged, black feathers located on either flank. Range: Found year-round in southern Africa from Namibia to Botswana and South Africa. Non-migratory. Habitat: Acacia savannahs of the Kalahari and Namib deserts. Range coincides with that of stout trees and stiff dry grasses that provide needed building material for large nests. Population in Wild: Range-wide population not quantified, though local distributions are often described as being common to abundant. One estimate of c. 16,000 birds in Kgalagadi Transfrontier Park. Locomotion: On the ground, shuffle feet to walk for one or two steps. Hop most commonly; feet held together, only coming slightly apart . In flight, agile and highly maneuverable. Cover short distances with rapidly beating wings. Alternating patterns of wing beats characterize long distance flights; bursts of rapid beats interrupted by a dip in the flight path as the wings are closed. Activity Cycle: Diurnal birds. Activity begins near dawn. Sleep in nest chambers at night. Social Groups: Highly social, birds cooperatively build and maintain large nests which may house up to 500 individuals. Non-reproductive adults often sere as helpers, feeding young chicks of fellow colony members. Diet: Eat insects and grains (typically grass seeds). Typical foods include harvester termites (Hodotermes mossambicus) and the seeds of green grasses. Predators: Cape cobra (Naja nivea) and boomslang (Dispholidus typus) snakes are common nest predators. Various raptors may take adults in flight. Birds on the ground may fall prey to yellow and red mongoose (Cynoctis penicillata, Myonax ratlamuchi), caracal (Felis caracal), and Cape wild cat (F. lybica). Incubation: 13-15 days; begins with laying of the second egg in a clutch. Shell dull-white and densely spotted with shades of gray; measure 18.1-22.8 mm (tall) x 13.2-15.9 mm (wide) (0.7-0.9 in x 0.5-0.6 in). Interclutch Interval: Variable; Quickly produce a replacement clutch following an unsuccessful brooding attempt, most often within 1 week. Produce multiple clutches within a single reproductive period when conditions are suitable. Longevity: Survive > 15 years in captivity; in the wild to 12 years. Feature Facts: Though the appearance of Sociable Weavers is rather unremarkable, their nests are a site to behold. These small, finch-like birds live in large colonies and construct nests which can measure nearly 7 m (23 ft) in diameter. This large mass contains numerous small nest chambers within which mated pairs reproduce. Mate pairs may remain together for several years, producing several clutches of eggs each year. The large nest masses of these small birds also provide structure for other animals. Many invertebrates, such as social wasps, make their home within Sociable Weaver nests, and their presence may attract vertebrate "squatters" such as skinks and geckos. Many species of birds take up residence on top of or within nest masses. © 2015 San Diego Zoo Global. Updated May 2015. How to cite: Sociable Weaver (Philetairus socius) Fact Sheet. c2015. San Diego (CA): San Diego Zoo Global; [accessed YYYY Mmm dd]. http://ielc.libguides.com/sdzg/factsheets/ sociableweaver. We wish to thank Dr. Rita Covas for providing expert content review of this fact sheet. Dr. Covas began studying the Sociable Weaver in South Africa in 1998. Her work has advanced understanding of cooperative breeding systems and their relationship to life history strategies, though her research interests are not limited to this topic. Dr. Covas is currently a Senior Researcher at CIBIO, University of Porto (Portugal), and she serves as a research associate with the Percy FitzPatrick Institute of African Ornithology.